Old fashioned rock candy is as fun to make as it to eat. In doing this experiment, you’ll experience first hand the properties of saturated and unsaturated solutions and the effect that heat has on both. While there may be more exciting at home science experiments for kids, this one is definitely the sweetest. 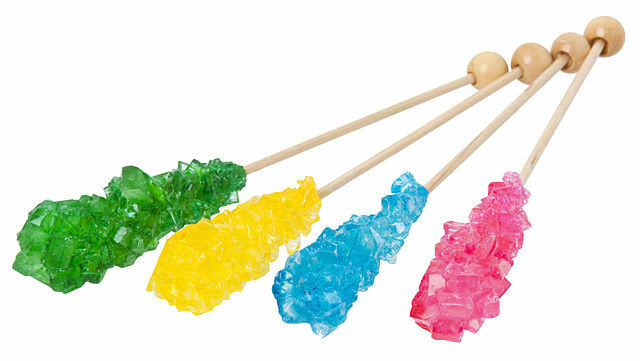 Create your own Rock Candy in this simple science experiment for kids. An adult to help you because this experiment uses extremely hot liquids. Pour the water into the pan and bring it to a boil. Add ½ c. of sugar and stir it until it dissolves. Keep adding more sugar, ¼ c. at a time until no more sugar will dissolve. Stir continuously. This requires time and patience because as you add more and more sugar, it will take longer for it to dissolve. This is also where most mistakes are made. People lose patience and quit stirring too early. If you don’t create a completely saturated sugar/water solution, your rock candy will not form. Once you are sure that no more sugar will dissolve into the water, remove the pot from the heat. If you would like to stir food color in to your solution, do so now. Allow the solution to cool for at least 25 minutes. While the mixture is cooling, dip the skewer into the solution and roll it in sugar. This will give the crystals a head start so they will grow faster. Have an adult pour the sugar solution into a clean glass. Clip the skewer into the clothespin and lay the clothespin across the top of the jar so that the skewer hangs down into the liquid but does not touch the bottom. Carefully move your jar to a place where your jar will not be disturbed. Your crystals will grow in 3 to 7 days. How does the science behind this work? Well, when you heated the water and added the sugar, you created a completely saturated solution. The water could only dissolve that much sugar because it was so hot. Therefore, when the solution cooled, the sugar was released from the water and solid sugar crystals formed creating Rock Candy. Want to try some other SWEET science experiments? The Soda Geyser Car uses Mentos candy and a 2 liter bottle of soda to create a rocket car. The Great Geysers Science Kit uses similar candy and the principles of chemical reactions to create some amazing geysers. Check out JM Cremp’s Science Department for these and other great at home science experiments for kids. The above photo”Rock Candy Sticks” by Evan-Amos is licensed under CC 3.0.